no mas pantalones: Upstate. Clothing Co. "Friend"
I was laying out all of my gear for snowboarding tomorrow (because I can barely function at 5 am) and pulled out this oldie but goodie from Upstate. Clothing Co out of my closet. Featured in a 2011 YoBeat article entitled "Five Companies You've (Probably) Never Heard Of" which highlighted small, rider owned clothing companies, I dug the "Friend" t shirt the moment I laid eyes on it. Options include an olive, dark purple or heather gray colorway (all in limited sizes), and you can still grab one for only $10. 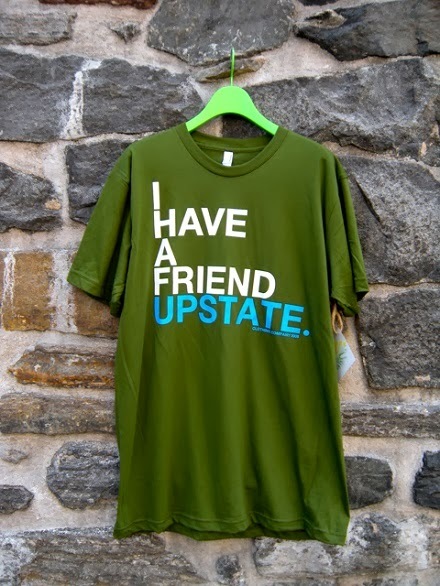 Off the mountain, the color combos work well together, the American Apparel blank feels good, and passersby will chuckle depending on their definition of "upstate."